Pendleton is an American textile company known for its blankets and throws. The brand also creates and distributes a variety of men’s and women’s clothing and accessories in addition to home decor. With Big Apple Buddy’s personal shopping service, you can now buy direct from the USA Pendleton online store anytime, anywhere. There are plenty of stylish accessories you can shop from at the USA Pendleton online store. The Peyton Perforated Tote is a roomy and refined tote with easy over-the-shoulder straps that will comfortably carry all of your everyday necessities. 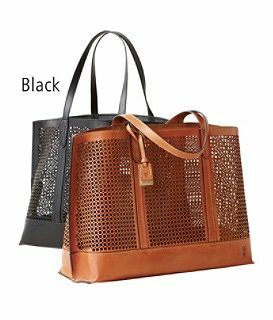 This full-grain leather bag features a perforated design that is right on-trend, and it will set it apart from all the other totes in your closet. Whether you bring this bag along with you to work or for a day at the beach, it will safely and stylishly carry all of your essentials! You have the choice of either black or tan leather -- which one best matches your wardrobe? At Pendleton, you can shop from a variety of different clothing options, whether you’re looking for something casual or professional. The Boyfriend Blazer will give you a relaxed look that works great either for a day at the office or for a day out shopping with friends. This jacket is designed with very subtle shaping, so it will look great on all kinds of body types. The welt pockets on the front of the jacket will conveniently hold your phone or wallet. This jacket will become a new staple in your wardrobe-- the light tan color makes it easy to match with the other pieces in your wardrobe, and it can easily make a casual outfit look a bit more professional and put-together! Pendleton also has a variety of shoe options to shop from, and there is something out there for every occasion. 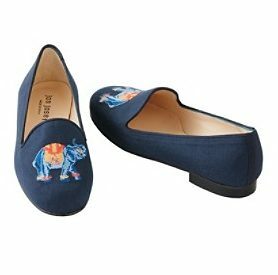 These Elephant Print Flats are a fun and comfortable option to bring a bit of extra flair to any outfit. These linen shoes are made with leather linings and rubber soles and are the perfect conversation starter! If you ever want to bring something extra to your outfit without sporting a pair of uncomfortable heels, these shoes are the perfect option! There’s no better way to unleash your inner animal lover. Unfortunately, the USA Pendleton online store does not currently offer international shipping. However, Big Apple Buddy, your personal shopper, can help you buy products direct from the official USA Pendleton online store and ship them to your doorstep, no matter where you are in the world. We offer international shipping to over 110 countries including Australia, Austria, Azerbaijan, Bahrain, Belgium, British Virgin Islands, Brunei, Bulgaria, Canada, Chile, Costa Rica, Croatia, Czech Republic, Denmark, Estonia, Fiji, Finland, France, French Polynesia, Germany, Gibraltar, Greece, Greenland, Hong Kong, Hungary, Iceland, Indonesia, Ireland, Israel, Italy, Japan, Jordan, Kuwait, Latvia, Liechtenstein, Lithuania, Luxembourg, Macau, Malaysia, Maldives, Malta, Marshall Islands, Mauritius, Monaco, the Netherlands, Netherland Antilles, New Zealand, Norway, Oman, Poland, Qatar, Romania, San Marino, Saudi Arabia, Serbia and Montenegro, Seychelles, Singapore, Slovak Republic, Slovenia, Spain, South Africa, St. Lucia, Sweden, Switzerland, Taiwan, Thailand, the UAE, the UK, Vatican City, and Vietnam. If you would like to buy from the USA Pendleton online store, simply let us know which items you would like to order (by filling out the form below) and we’ll get back to you with a free international shipping quote within 24 hours!